However, truckers have spared other vegetables, fruits, fuel and milk from the strike. Supplies of essential commodities were partly disrupted at most of mandis across the country on Monday, due to an indefinite, nationwide transporters' strike in protest of a sharp rise in diesel prices and insurance premiums. Data compiled by the National Horticultural Research & Development Foundation (NHRDF) showed onion supply in the benchmark Lasalgaon mandi at 1,400 tonnes on Monday, down from 1,717 tonnes on Friday. Supply in Pimpalgaon mandi also declined to 1,980 tonnes on Monday from 2,510.5 tonnes on Friday. The decline in onion supply has resulted into an increase in the vegetable's price in both Lasalgaon and Pimpalgaon mandis. 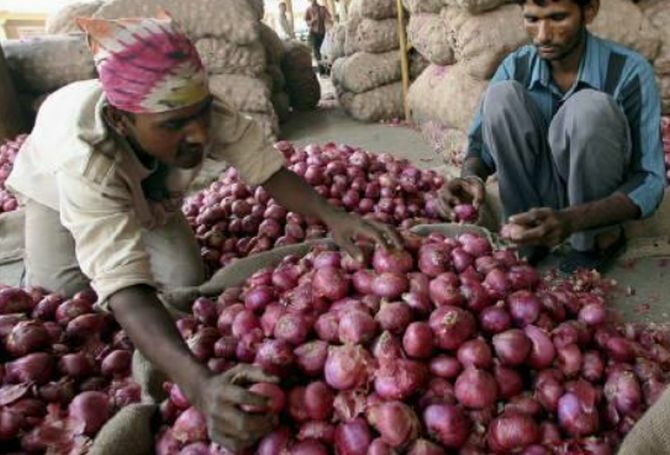 Model onion prices surged 55 per cent on Monday to trade at Rs 8.50 a kg on Monday in Asia's largest onion selling market yard in Lasalgaon, from Rs 5.50 a kg on Friday. The spike in price was marginal in Pimpalgaon, closing at Rs 9 a kg on Monday from Rs 8.40 on Friday. "Onion supply was disrupted on Monday at Lasalgaon and Pimpalgaon mandis in the Nashik district of Maharashtra due to a fewer number of trucks plying between farmland and marketyard. We would have to see how the strike pans out in coming days and impacts prices of essential commodities," said Atul Shah, director, Pimpalgaon mandi. Meanwhile, truckers have spared other vegetables, fruits, fuel and milk from the strike. Consequently, their supply to mandis wasn't as impacted. Also, the premier transporters' body, All India Motor Transport Congress (AIMTC), which has a huge presence in western and southern India, has decided not to support the ongoing strike convened by ACOGOA. "We went on strike om Monday morning. Since most of the trucks had already uploaded goods a day before and transported for offloading in mandis across the country that day, the impact of the strike was limited. "Still, supply of goods was disrupted in Maharashtra, West Bengal, Delhi and other agrarian states. We are expecting the impact to become severe on the second and third day of the strike," said R S Bhasin, National Secretary, All India Confederation of Goods Vehicle Owners Association (ACOGOA). Bhasin claims most transport vehicles have started staying off the road in Maharashtra, Karnataka, Tamil Nadu and Uttar Pradesh borders. "The government procures nearly 85 per cent of crude oil on long-term contract basis with a fixed price for at least three months. "However, it revises diesel prices daily. For example, in the second half of May diesel prices surged by Rs 3.40 a litre with the rise in crude oil prices. "But, its price declines by a few paise with decline in crude oil prices globally. "While upward price revision is immediately passed on to consumers, downward revision either lags or does not happen at all. "This system of price revision results in a massive loss to truck owners. We therefore, want the government to revise diesel prices on quarterly basis for a long-term and sustainable business plan for truck owners," said Bhasin. Apart from daily diesel price revision, truckers want the Rs 8-per-litre cess to be abolished, and a reduction in toll charges and premiums on third party insurance. Through diesel price hike alone, the government is getting at least Rs one billion per day, Bhasin said. ACOGOA claims that a third of India's total fleet size of nearly nine million commercial vehicles has stopped loading goods. What's cooking at Indian Railways?